I admit it has been a long time since I ate at Go Nuts Donuts because of all the new donut stores that attract long lines. 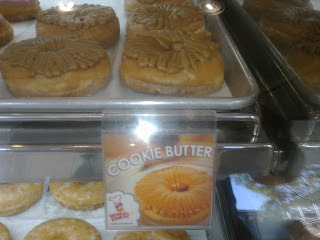 However, their new offering, the Cookie Butter Donut really caught my attention. It is apparently a plain glazed donut topped with sinful cookie butter spread. 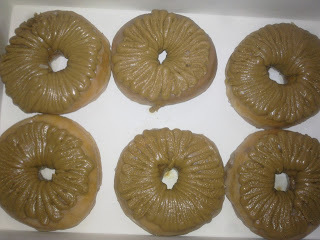 I was lucky enough to be one of the bloggers selected to get a sample box full of Cookie Butter donuts. 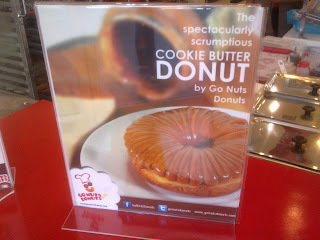 I have to admit Gonuts Donuts made a really sinful donut with the Cookie Butter donut and those who have the sweet tooth would love it. Before I tasted it, I admit I had low expectations but the doughnut REALLY exceeded my expectations. I really recommend these donuts and it is very rare for a donut store to have one donut stand above the rest and the Cookie Butter Donuts did just that. These donuts are so delicious that I did not let anybody else have any of these donuts as I managed to finish them all by myself. Before, I was disappointed that my favorite donut of Go Nuts, the Mocha Lite got phased out. 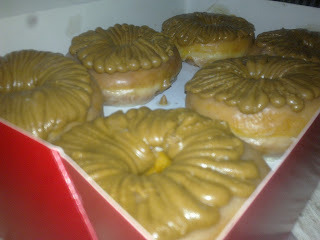 But now, I forgive them with this new offering, the Cookie Butter donuts. It is a delightful dessert everyone would enjoy. Cookie Butter Donuts is available in selected Go Nuts stores include Sm Megamall, SM Makati, Market Market and SM North Edsa. What are you waiting for? Grab a bite and find out why everyone is raving about the Cookie Butter Donuts. Eating a lot of donuts... Too much calories. Come on, give yourself a treat once in a while. I havent been to go nuts for ages. I think more than 6yrs ago. Tsk... Will try to check this out. Do nut is my favorite dessert, it is easy to grab and my kids don't miss to get buy their favorite flavors every time we go grocery shopping.